PENTICTON, B.C. – The Chilliwack Chiefs (2-1-0) have been rude guests in Penticton in recent weeks. The Chiefs dashed the Penticton Vees (1-1-1) Western Canada Cup championship aspirations with a 4-2 win Tuesday night at the SOEC. Will Calverley scored the game-winner, midway through the second period, as the Chiefs won their second in a row at the tournament, vaulting themselves into second place behind the Brooks Bandits (3-0-0). Tuesday is the second time in just over a week the Chiefs squashed aspirations of a championship on home ice for Penticton. 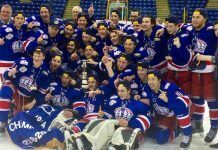 In the Fred Page Cup Final, they beat the Vees 3-2 in Game Six, on a night the Vees had a chance to win the BCHL championship at home for the first time in 31 years. Fast-forward to Tuesday, and it was the Chiefs once again negating a chance for the Vees to lift a trophy on home ice. 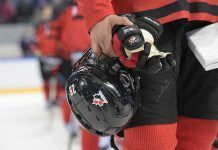 It was the Vees opening the scoring, as 20-year-old Duncan Campbell kept the puck on a two-on-one rush and snapped it far side, past the blocker of Chiefs’ goalie Mark Sinclair, with just over five-minutes left in the first period. Chilliwack responded quickly, tying the game not even two-minutes later, as Will Calverley picked up his first of the tournament. The Chiefs’ forward cut to the middle, before going to his backhand and cutting around Mat Robson at 16:30. The Chiefs then got a late power-play and they didn’t waste the opportunity. With just half a minute left in the frame, Justin Dixson feverishly dug the puck out of a scrum at the top of the Vees’ crease and shoveled it in past a host of defenders, to put the Chiefs up 2-1 in the dying moments. It was a lackluster effort in the first, as the Vees were outshot 10-3 but they turned it around from the second period on, out shooting the Chiefs 28-12 over the final 40-minutes. Penticton tied it back up in the second and on the power-play. Vees’ Captain Nic jones showed great poise at the side of the net, before threading a cross-ice pass to Taylor Ward who made no mistake; Ward scoring his first of the tournament six and a half minutes into the second. However, the Chiefs had another quick response to a Vees goal, going back ahead less than two minutes later. Calverley scored his second of the game and the eventual game-winner, on a bit of lucky bounce. Calverley threw the puck to the net from the wall and it caught a piece of Gabe Bast’s skate before knuckling back behind Mat Robson just past the eight-minute mark. Penticton certainly applied the pressure in the third, outshooting the Chiefs 15-4 in the final stanza and had four straight power-plays but they couldn’t manufacture an equalizer. The Vees best chance in the third came short-handed no less, as Jones almost went end-to-end. The Captain motored his way through the neutral zone before dancing around several defenders, but he couldn’t slide the puck through the legs of Sinclair at the top of the crease. Anthony Vincent sealed the win for the Chilliwack with an empty-net goal with just five-seconds left on the clock. The win clinched a spot in the playoff round for the Chiefs as they now can’t finish lower than fourth. 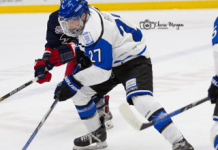 The Vees may not be able to play in the Western Canada Cup championship game, but they can still qualify for the playoff round by picking up at least a single point against the Portage Terriers Thursday.